With immense expertise and industry knowledge, we are actively engaged in providing Cable Trolleys. The offered cable trolleys are appreciated for their longer service life. We design the offered cable trolleys by utilizing the excellent quality material and leading techniques keeping in mind the set norms. 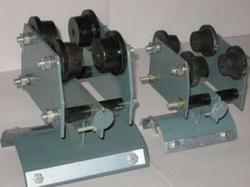 Additionally, we are giving these cable trolleys only after checking properly against numerous parameters. We are the leading manufactures and suppliers of Cable Trolleys in Coimbatore, Mettupalayam, Salem, Tirupur, Pollachi, Trichy, Salem, Erode, Madurai, Tirunelveli , Chennai, Nagarkovil, Kanniyakumari, Tuticorin, Namakkal, Vellore,Theni, Dindugul, Ooty, Kunoor, Valparai, Kodaikanal, Kannur, Kozhikode, Malappuram, Palakkad, Wyanad, Kasargod, Kalpatia, Thrissur, Eranakulam, Iduki, Kootayam, Alapuzha, Kollam, Thiruvananthapuram, Patmanathitta, Kurnool, Anantapur, Cuddapah, Nellore, Chitoor, Prakasam, Guntur, Krishna, West Godaveri, East Godaveri, Vishakapattinam, Chikmangalur, ChitraDurga, Hassan, Tumkur, Mandya, Bangalore, Kodagu, Mysore, Kolar, Tamilnadu, Karnataka, Andrapradesh, Kerala and India..
We are Manufacturer and Supplier of the best quality Chain Pulley Blocks, which are widely used by the clients for various industrial purposes to lift goods. 'Loadmate' Motorized Chain Pulley Blocks is manufactured using finest quality material sourced from the authentic vendors in the market. To meet the specific requirements of our clients, we also provide customized solutions to them. All 'Loadmate' products are available with matching to industry standards. As an experienced manufacturer in this domain, we are more convinced to offer high quality machines with admirable services. We are the leading manufactures and suppliers of Chain Pulley Blocks in Coimbatore, Mettupalayam, Salem, Tirupur, Pollachi, Trichy, Salem, Erode, Madurai, Tirunelveli , Chennai, Nagarkovil, Kanniyakumari, Tuticorin, Namakkal, Vellore,Theni, Dindugul, Ooty, Kunoor, Valparai, Kodaikanal, Kannur, Kozhikode, Malappuram, Palakkad, Wyanad, Kasargod, Kalpatia, Thrissur, Eranakulam, Iduki, Kootayam, Alapuzha, Kollam, Thiruvananthapuram, Patmanathitta, Kurnool, Anantapur, Cuddapah, Nellore, Chitoor, Prakasam, Guntur, Krishna, West Godaveri, East Godaveri, Vishakapattinam, Chikmangalur, ChitraDurga, Hassan, Tumkur, Mandya, Bangalore, Kodagu, Mysore, Kolar, Tamilnadu, Karnataka, Andrapradesh, Kerala and India.. 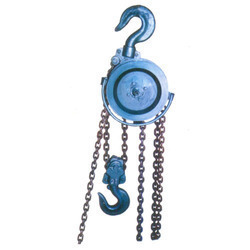 Looking for Chain Pulley Blocks ?